This is a rerun of the Saison I made last year for Libby and Aaron's wedding. The vanilla saison was absolutely delicious and was a huge hit at the wedding. I only made 2.5 gallons for the wedding, this time I'm trying to make more. I bought 5 vanilla beans from Amazon, they've been soaking in Everclear since April 18, and are still soaking. 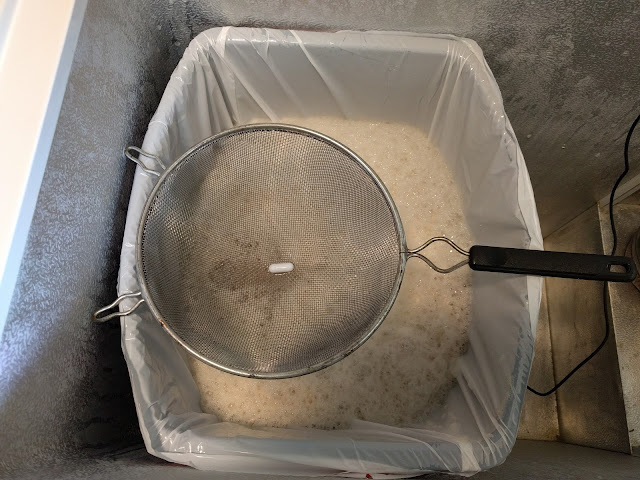 I won't add the vanilla until kegging time, and then I'm not sure if that is enough for 10 gallons, it might only go into 5 gallons so there is enough vanilla flavor. Mashed at 151F. I was aiming for 148F, but there you go. I didn't bother to correct the temp, but did adjust the pH to 5.2. Wyeast 3724, Belgian Saison yeast. Ferment at 68F. I bought two packages and made a starter, video below. Update April 30, 2017, dropped the temp to 66F since I brewed a Panama Red today and 1272 likes 66F better. Update May 6, 2017, I thought this would be done by now, so I went to keg it and found that the gravity is still at 1.030. I thought 2 packages in a starter would be enough. I pitched another 2 quarts of the same yeast, but it is fairly old, so we'll see. Update May 11, 2017, the gravity is still not quite where I want it, it's at 1.020, I'd like that to drop another 5 points or so. I finally figured out how to not pour the stir bar into the fermenter! Grinding grain, I love this mill. Update, 22 May 2017, finally got this kegged. It took a long time to ferment, I was able to do brew a batch of Panama Red and keg it in the mean time. I dumped the Everclear/vanilla into just one of the 2 kegs, which should make that one delicious and more alcoholic! Update, 29 May 2017, there really isn't much vanilla flavor, so I got a bottle of vanilla extract from Costco (good price, $24 for 16 oz) and added 1/4 cup to the saison. Update, 10 June 2017, it's still not very good. Too much vanilla. I haven't done anything with the second keg yet. I'm hoping the vanilla will fade on the first keg, then I'll see about adding anything to the second. Update, 11 Sep 2017, Angie asked if I could do another fennel beer, so I split out the second keg and added some fennel that she's soaked in vodka to half. I'd bought a little bag of "Miners Tea" at a craft fair a while back that I thought would be nice in a saison, so I added that to the other half. It's not bad, but not as good as I'd hoped. I probably let it steep a little too long in the beer. Live and learn! It is pretty good when mixed with cider. The fennel half is carbonating, haven't tasted it yet. Update, 10 Oct 2017, the fennel beer is quite good, the vanilla is okay, but still too strong in my opinion.